Want 'At the Library' emailed to you right when they’re published? Sign up here. Essential oils have long been used for food preparation, beauty treatment, and health-care practices. 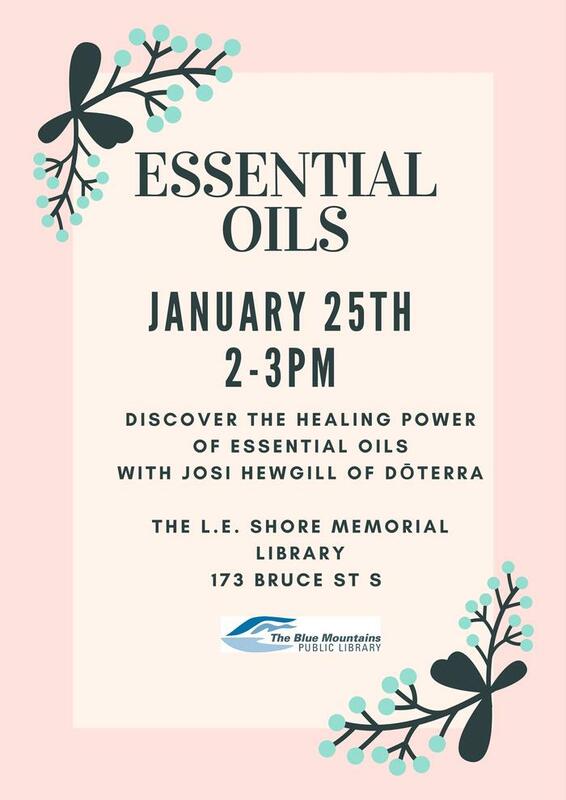 Discover the healing power of essential oils. What exactly are they? How do they work? How do you get started? 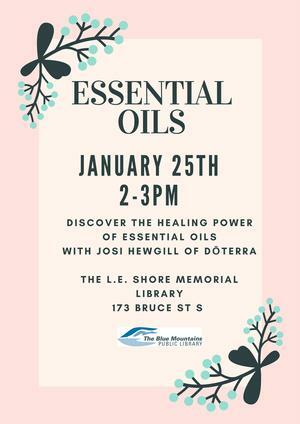 Josi Hewgill, from doTERRA, will be giving an Essential Oils 101 talk in the L.E. Shore Memorial Library Gallery. Free. Drop-in Program. Everyone is welcome. Parlez-vous français? In honour of Canada 150, celebrate with the Blue Mountains Public Library.12 months, 12 themes. January's theme is Champlain's Footsteps with a focus on Early Explorers and the French language. Join our Conversational French classes, open to all ages. This program will teach the basics in French language and allow people to practice their French skills. In celebration of Canada 150, starting on January 16th you can borrow snowshoes using your library card. Thanks to the generosity of Scenic Caves, the library is happy to be loaning out limited sets of snowshoes for the winter season. Ask at the Front Desk for more information. And speaking of snowshoes...make sure to check out Champlain's Footsetps at The Craigleith Heritage Depot on Sunday January 15th from 1pm-4pm! Celebrate Canada 150 by learning about early explorers and First Peoples in The Blue Mountains, exactly 401 years after Samuel de Champlain traveled through this region to meet the Petun!